The SS Eastland was commissioned by the Michigan Steamship Company in 1902 as a passenger tour ship and built by Jenks Ship Building Company of Port Huron. She was intended to sail a route from South Haven, Michigan to Chicago, Illinois, making stops in between and being chartered for private events. The Eastland in her prime. From lakeeffectliving.com. Unfortunately, she was no sooner launched in 1903 that she became plagued with problems. Flaws in her design resulted in a high centre of gravity and a susceptibility to listing. In July 1903, just two months after she was christened, passengers were gathered on her upper decks when suddenly, the ship listed so far that water began to pour up one of her gangplanks. A year later, a similar incident happened and resulted in complaints being filed by the passengers. 1905 saw her stern damaged when a tugboat backed into her. In August 1906, six of her firemen mutinied after claiming they had not received their potatoes with their meal. The captain, Capt. Pereue, had them arrested at gunpoint, charged with mutiny, and thrown in jail. Over the course of her career, her ownership changed hands quite a few times. 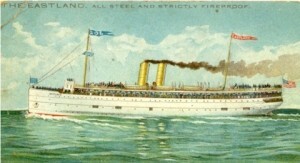 In 1915, the Eastland was sold to St. Joseph & Chicago Steamship Company. At the same time, the Seaman's Act had been passed. This came about from the sinking of RMS Titanic, a tragedy that resulted in the complete overhaul of shipping and safety practices. This included outfitting existing vessels with more lifeboats - enough for every soul on board. Ironically, this addition to the SS Eastland most likely lead to her becoming more dangerous. The SS Eastland. Image from Wikipedia. On July 24, 1915, the Western Electric Company had chartered the Eastland, as well as the SS Theodore Roosevelt and the SS Petoskey for a company event. The plan was for the company workers to be treated to a three hour cruise to Michigan City's Washington Park. They would spend the day at the park picnicking and participating in activities, before boarding the ships and taking a three hour cruise back to Cicero. For many families that couldn't usually afford to go on holidays, this promised to be a wonderful treat! At 6:30am, the Eastland started boarding passengers, and by just after 7am all 2,572 picnic attendees were on board. Crowds formed on the upper decks, excitedly waiting for the ship's departure. Due to the early hour and cool air, some passengers retreated indoors to warm up before the voyage began. As the crowds moved around the upper deck, the ship began to list to port - away from the dock. The engineering crew moved quickly, trying to compensate by flooding the starboard ballast tanks. It was too late, and at 7:28am the Eastland suddenly snapped to port, resting completely on her side in the 6m water of the Chicago River. The Kenosha rescuing survivors off the capsized Eastland. Image from the Chicago Tribune. Crowds on shore watched horrified as passengers were thrown from the upper decks and into the river. Many who were in the ship were trapped - either by the sudden rush of water or by heavier objects such as chairs, pianos, and other objects that were flung across the ship. A nearby vessel, the Kenosha, quickly pulled alongside and tried to pull as many as they could to safety. Makeshift bridges of smaller crafts were constructed from the crippled vessel to the dock and passengers and crew were evacuated as quickly as possible. From the St. John's Daily Star, July 24, 1915. In the aftermath, charges were laid against the president of the shipping company, the captain, and the ships officers. The inquest found that the ship had been under "conditions of instability" including overcrowding, flawed construction, and a mishandling of the ballast when the ship began to list. Surprisingly, the Eastland's career didn't end here. She was floated and repaired in August 1915, as the hundreds who had perished were mourned. She was sold to the Illinois branch of the American Naval Reserve, and commissioned as the USS Wilmette. Stationed at the Great Lakes Naval Base, she became a gunboat who served to transport reservists throughout the waters of the Great Lakes. After the Second World War, she was tasked to sink UC-97, which had been surrendered to the United States by Germany. Following that, in late 1945 she was decommissioned and offered up for sale the following year. When the Navy found no buyers, she was sent to Hyman Michaels Company in 1947 and finally scrapped. If you have any questions or comments, feel free to contact me or reach out to me on Twitter. From St. John's Daily Star, August 6, 1915. 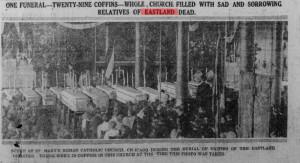 Funeral for Eastland Victims. From St. John's Daily Star, August 7, 1915.